THE WRITING BUDDHA - Opinions | Books | Movies: Family Life by Akhil Sharma (Book Review-2.5*/5) !!! 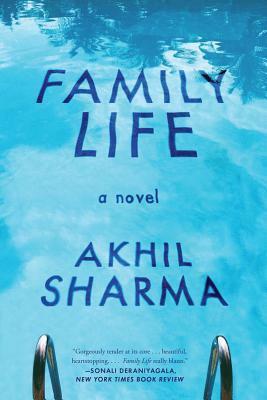 Family Life by Akhil Sharma (Book Review-2.5*/5) !!! I had heard about Akhil Sharma's "Family Life" a lot when it was released more than an year ago and since then I wanted to read it. But no one had told me that its a tragic story. As I am done reading this novel which is not quite lengthy, I have a totally different kind of emotional turmoil in my head. I am unable to understand if I liked the book or not. It is kind of a memoir and autobiographical narration where a small boy starts telling his story in terms of how each of his family members are. He tells about the relationship each one of them share with each other. As the book progresses, the story keeps taking leap and it finally reaches to making the protagonist earn his graduation degree in the climax. The story mainly focuses on many emotions that the protagonist goes through in his life and how his thoughts keep getting changed with age. The book moves very slowly which might make people leave it in between as even I found it hard to continue with it after some 35-40 pages. No conversation is described in the book but only the thought process of the boy who is telling his story. It is all fine until he is in school but the quality of narration and language remains the same even when he turns into an adult. It is quite disappointing then as you want author to change the lane of the language in which the book is written and the fact that author have taken almost a decade to complete this book, expectations were quite higher. Some issues are nicely depicted in the book regarding how racism gets introduced for a middle-class Indian when he gets migrated to a foreign land initially. Also how Indians are always looked down because of their standard of living is also well-stated. The emotions regarding other Indians in a foreign land is also discussed and that's the most cutest segments in the book. Haha! The protagonist is uncomfortable when it comes to girl and therefore reading even those scenarios were also enjoyable. Whenever author starts discussing the condition of his ill brother and alcoholic father, the book takes a tragic turn and it becomes hard to digest those chapters. Dysfunctional family life is what this book is all about and may be this genre wasn't for me hence I do not have much say whether you should go with it or not. I give it 2.5 stars from my side.